Have an aggressive government and an overreaching judiciary curbed dissent? It is a spring India’s civil society will remember for a long time. A series of government and judicial pronouncements this February has created a flutter among non- government organisations (NGOs) and activists working on key governance issues. First, a usually soft-spoken and media-shy prime minister, Manmohan Singh, chose a science journal to accuse NGOs of using foreign money to work against national interest. 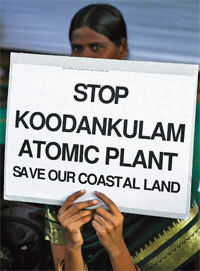 He spoke in context of the ongoing anti- nuclear power plant protests in Kudankulam, Tamil Nadu. Second, the Supreme Court directed the Central government to speed up the project of interlinking rivers. It also set up a committee to work with the Union Cabinet on the project. Third, when the apex court cancelled 122 telecom operators’ licences in the infamous spectrum allocation scandal, it also stamped the fit-all-sectors competitive auction as the only method of selling natural resources (see ‘What caused the flutter’,). Such developments have a direct impact on civil society, both in its work as well as its credibility. Civil society groups have been major opponents and movers in the spectrum scandal, river interlinking cases and the anti-nuclear power project agitation. A non-responsive government forced them to appeal to the judiciary for justice. But the Supreme Court verdicts put major concerns of civil society in the doldrums. 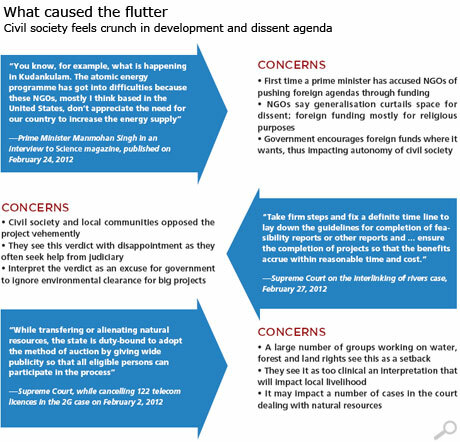 Soon after the prime minister’s interview to the science journal, the government began an extensive scrutiny of NGOs that receive money from foreign donors. At present, the Directorate of Revenue Intelligence and the Central Economic Intelligence Bureau are probing 77 NGOs that receive money from the US and Europe. The list of NGOs for scrutiny was prepared a year ago, say senior home ministry officials. But the fact that two revenue-related intelligence bodies are investigating them is unusual, they say. The Ministry of Home Affairs has informed Indian missions across the globe to keep a tab on the activities of these 77 NGOs. But Union home secretary R K Singh denies mounting investigation. “It is incorrect to say that 77 NGOs are being investigated. 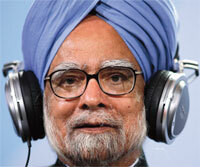 We are looking into the accounts of 12-13 Indian NGOs with regard to allegation of funds diversion,” he says. For some time now, the Intelligence Bureau (IB) has been monitoring NGOs and activists working in 200 districts affected by Maoist insurgency. Since last year, the IB has been specifically keeping a check on 50 NGOs that have received funding from foreign donors or corporate houses that have investments in local areas. The prime minister’s statement is a culmination of the government’s restlessness with civil society for more than a decade, says Rajesh Tandon, former chairperson of Voluntary Action Network India (VANI), an apex body of non-profits. The statement coincides with the boom in business related to natural resources— opening of mining, extensive forest clearances for infrastructure and industries, and private land acquisition. 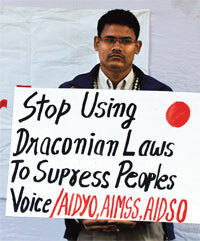 These have been widely protested by communities in Chhattisgarh, Jharkhand and Odisha. NGOs have played supportive roles in these protests. “The government does not know how to manage this dissent. That is why the reaction appears vindictive,” says Tandon. Many perceive the prime minister’s reaction as an extension of the strained relationship between two sides of the anti-corruption campaign of last year (see ‘Meltdown’, Down To Earth, July 16-31, 2011). The government and political parties vehemently questioned civil society’s “legitimacy” in taking up legislative roles. His statement has further precipitated this debate into what “legitimate” issues civil society should work on. The judicial pronouncements have, in fact, added to the debate, albeit by default. “Government wants civil society as a crutch. It wants them in areas where government is not capable of performing. But when civil society contests, questions and talks of issues of their concern, tension builds,” says Yamini Aiyar of the Centre for Policy Research, a think-tank in Delhi. “There is confusion of roles to be played by the government, non-government and the judiciary. It may be an evolutionary situation,” she says. There may not be a design in the current development, says Amitabh Behar of the National Foundation of India, a Delhi based non-profit. But it is true that there is decreasing space for civil society groups and increase in citizens’ actions, he adds. He cites examples of the recent anti-corruption campaign and people’s movements against land acquisitions that witnessed large-scale people’s support. For John Samuel, a commentator on governance and public institutions, government wants to fix the space and issues for NGOs. “Those who remain out of this invited space are being squeezed out in various ways,” says Samuel. Denying access to funds is one way of doing so. Contrary to government belief, foreign funds for NGOs working on development issues are only about Rs 2,000 crore annually. This is 20 per cent of the total foreign money for the voluntary sector. Funds have drastically reduced in the past 15 years because government stopped many foreign donors. In addition, the character of foreign support has changed. Religious organisations get more foreign funds now, and the amount is increasing. Money for development NGOs has reduced by 55 per cent in the past decade. Since September last year, the government has limited tax exemptions for grants to NGOs working on sectors like health, education and environment. Some 300 NGOs have started paying tax while a few others were served fresh notices last month (see ‘Foreign fund: free flow in most nations, restricted in India’,). “It is a heavy financial burden. In the long term, it will force them to migrate to areas where the government has indirectly told them to work in,” says Tandon. This is the most worrisome government onslaught on NGOs, he says. This leaves NGOs with only government and corporate social responsibility (CSR) funds of industries. At present, the CSR money is much more than the total foreign funds accessed by NGOs. “Unlike in developed countries, no group in India will survive on government money and take up anti-government policy works. There are many who prefer not to accept CSR money,” says Tandon. The apex court’s orders professing auction of natural resources has also not gone down well with groups working on community rights to water, land and forests. Already, there are talks of countering it through public protests. “But that will again bring us face to face with both the government and the court,” says a senior community leader in Chhattisgarh who is pursuing cases in the apex court. The Central government is yet to make presidential reference on the order to the court that will ask for reconsideration. On the order on interlinking of rivers, though groups did not fight in court, they are now caught in a bind. There has been massive people’s mobilisation by civil society groups in early 2000s against the project. “One clause of the order says the decision of the committee (set up by the apex court) is over and above the decisions of all other administrative bodies. This could be interpreted as circumventing the processes of environmental and investment clearances,” says Sripad Dharmadhikary. Dharmadhikary is the founder of Manthan, a research and advocacy group on water. The process of environmental clearance is often used by communities and civil society to oppose a potential damaging project. “It is true that the judiciary has been overactive in many cases recently, but it is difficult to generalise the trend on whether civil society has gained or lost from it. In the 2G verdict, the Supreme Court has actually recognised the role of civil society and vigilant citizens in bringing facts to the court,” says Ritwick Dutta, a lawyer in Supreme Court who takes up public interest cases. At present, serious internal churning is taking place within the civil society. Many groups are yet to reconcile with the prime minister’s statement, while others see this as part of their own evolution in a new context. “The voluntary sector in India is in a very bad shape,” says Harsh Jaitely, executive director of VANI. “It is highly controlled and badly regulated. We do not have a nodal ministry or even a professional body on the lines of the Press Council of India or the Bar Council of India. The government can kick us whenever it wants to and we have no place to approach for our defense,” he says. But B D Sharma, former tribal welfare commissioner of India, believes that foreign funding does make NGOs’ voice of dissent weak because it allows the government to question their credibility. “It is better to be self-dependent for funding if you are working for a genuine cause,” he says. There is a major difference between India and other major developed and developing countries in the manner they deal with flow of money into or out of their sovereignty. India, through the Foreign Contribution (Regulation) Act (FCRA), has applied significant restrictions on the inflow of foreign funds. Tax regulations prohibit outflow of money raised in India. But many countries, even those in the West with perceived less need for “aid” dollars, have very permissive policies vis-à- vis inflow of foreign funds. They provide notable exceptions, permitting unfettered flow of funds into their country except for financing political activities. A comparative study of regulatory provisions for non-government organisations (NGOs) in seven countries done by Voluntary Action Network India, an apex body of non-profits, shows Canada and the US have no direct taxation on foreign grants. The only requirement is disclosure of source. Also, Japan and the UK do not have legislation addressing funding sources to their local charities. In the Philippines, a country with some very similar internal security concerns to that of India, the government has adopted a very open and liberal policy on the issue of foreign funding. It has three formulae by which foreign funds can be transferred to an NGO. First, the NGO can receive funding from foreign governments without the approval of the National Economic Development Authority. Second, funds from external agencies are transmitted through the government for the NGO. In the third model, foreign organisations directly support the efforts of local NGOs without requiring any government approval. Similarly in South Africa, donors are free to fund organisations and projects of their choice. India has a separately administered set of regulations governing the inflow of foreign money. The FCRA empowers the government to prohibit any foreign source from making payments in India. The Act mandates only registered NGOs to receive foreign funds. The registration has to be renewed every five years with the government retaining the power to reject applications for renewal. In comparison to other countries, in India NGOs face greater pressure in terms of domestic taxation laws. USA and Canada are the most progressive in this area —both provide income tax exemption to NGOs, whether registered or not. NGOs in India must not only register to be eligible for an income tax exemption, but must also be engaged in public benefit activities. The US and Canada allow exemption on income generated for profit activities if the proceeds go beyond the stated objectives of the organisation. The UK and Japan provide some exemptions with a ceiling above which income generated from profit activity is taxed. In India, the proposed direct tax code may tax income generated from profit activity except where that activity is component of the charitable exercise. Well thought and crafted please also include the exact nomenclature.